You've heard of man's best friend, but when you meet this barking Walking Dead inspired canine zombie skeleton attack guard dog you will surely not feel loved. 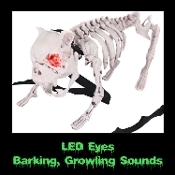 Sound activated with flashing light up eyes. 8.5-inch (21.25cm) Tall x 16.5-inch (41.25cm) Long x 7-inch (17.5cm) Wide. Requires 3-AG13 watch batteries which are NOT included. The slightest noise sets off his vicious barking, growling, snarling and fiercely glowing eyes that flash on and off in time to his barks. Guaranteed to scare the pants off anyone who dares cross his path! With plastic poseable body and hinged jaw that looks as menacing as he sounds, he also includes a detachable collar and 50-inch (125cm) long leash. Pet cemetery scary haunted house graveyard yard prop Halloween decoration.